Everyone has a headache at some point but if you suffer from regular tension headaches or migraines that get in the way of your life and work, they can be painful in more ways than one. The economic cost of headaches is something that few of us take time to consider but the facts and figures make interesting reading, particularly for migraine headaches. Migraines strike people often, more than 12 times a year being usual, and the headache experienced is severe and often disabling. Many people have to lie down in a dark room to recover. It is also usual for a migraine to last about 24 hours – but some are more long lasting, causing great disruption to normal activities. Migraine is one of the most common headaches in the UK and the costs of diagnosing and treating are close to £150 million every year. This covers visits to GPs and other health professionals and the cost of drugs prescribed to treat migraine. However, the total costs of migraine are far more than this – a staggering £2.25 billion every year in terms of lost economic output. Migraines are responsible for 25 millions days off work through illness. More money may be lost because of people struggling into work with a migraine but then not really being able to function at full capacity. Estimates put the real costs of migraines and all forms of headache at around £7 billion every year, just in the UK. The costs of migraine are far greater than the money spent in the UK on treating migraine, which is said to be less than 4% of the overall costs of migraine. Some experts argue that migraine, a readily treatable illness should be given a greater healthcare focus as so much money could be saved by reducing the economic impact of people taking time off work. Migraines are often cited by people as a major factor in their career path and work achievements. Because migraine headaches are so disabling, causing an intense dislike of bright light and nausea and even vomiting, this is not an illness that it is possible to ignore. Nearly 80% of people who suffer regular migraines say that their illness impacts on their lives quite severely, reducing their chances of promotion at work, making them more dependent on co workers and also more of a burden to their friends and family. Over 50% of people who have migraine say that their headaches affect their family and just over 25% say it also affects their social life and close relationships. The impact of migraine on the economy is particularly great because of the age range of those typically affected by migraines – the 30-50 year olds. This age group is at the peak of their working lives and, in the case of many women, represent people who are balancing an active working role with looking after young children. Like migraine, tension headaches are most common in people aged up to 50 but tension headaches affect people in their 20s as well as their 30s. 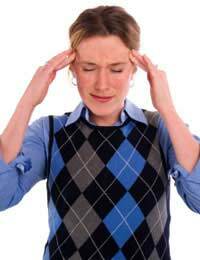 Slightly less than 20% of people with regular tension headaches find that their head pain interferes with their work. When the pain goes past a certain intensity, they find that they can no longer work and may even need to go home to recover. Tension headaches do not occur as often as migraines – maybe 3 days out of every month – so their contribution to economic losses through work absences is not as great. Although it is possible to provide some rough estimates of the economic costs of migraine and tension headache, what is much more difficult to estimate is the effect that experiencing regular and frequent headaches has in between the actual attacks. Around 8 out of 10 people questioned in a survey in 2007 said that their work was impaired even on days that they didn’t have headache pain – the fear of a headache coming on during a crucial meeting or prior to a ‘big day’ at work was very common. The World Health Organization say that headaches are among the top 20 causes of disabling illness throughout the world and they call for more funds to be put into treating headaches and on research to find out more about their origins and causes.